Alhamdulillah, berjaya juga menyambut bulan Ramadan kali ini. Hopefully this month will bring us closer to Allah. As usual I was happy when Ramadan comes. The first thing that I am glad is not eating during the day. This really save a lot of time. I just hope that the management don’t go crazy and set up back to back meeting without any break. I am praying and hoping that I am strong enough to be patient and stay positive especially during a trip back to my house. It’s going to be a massive traffic jam because everybody is going home at the same time. I usually can’t eat any solid food early in the morning. 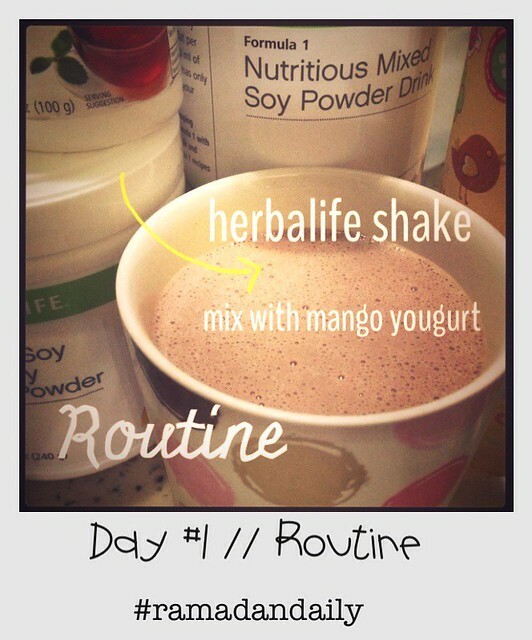 Herbalife shake really helps to keep me full and herbalife tea helps to give me energy for the day. I have been taking herbalife shake for about two years and so far I am happy with the way I feel.